Click here to watch my video review of the top 6 calculator apps for the iPhone. My recent article on the top 6 calculator apps for Android was a big hit, and since then I’ve been getting search inquiries about iOS. You asked for it, so here it is. I’ve searched out Apple’s app store for my favorite 6 calculator apps for the iPhone and iPod touch. Since there was a wide disparity in cost of apps, I set the ground rule that we were searching for apps that cost less than $5. In fact, this list turned out to be my favorite 6 iPhone calculator apps for under $3. Graphing Calculator+ is my pick for the best all around iPhone calculator app. It greatest strength is that it does so many different things well. A switch button takes you easily between the calculators different modes. Those modes are graphing, scientific, handwriting, a polynomial calculator, and linear equations calculator. There’s still room for improvement. In particular, we wish the scientific calculator had fractions, and that the grapher had trace. But the app is simple and powerful, and the fact that it automatically finds max, min, intercepts, and intersection points pretty much makes up for the lack of trace. I’m a huge fan of Graphicus. If only every graphing calculator were this easy to use. No need to read the user manual here, just jump right in. Graphicus brings you almost all the information you could want about Cartesian, polar, and parametrics graphs in an incredibly elegant interface. Trace, extrema, inflection points, tangent lines are all readily available with a few taps of your finger. On the downside, there is no simple scientific calculator. It’s also a minor bummer that there’s no 3D in an app that’s 100% focused on graphing, but there’s only one app on this list that has 3D. If you need a CAS for your iPhone, this is the app for you. 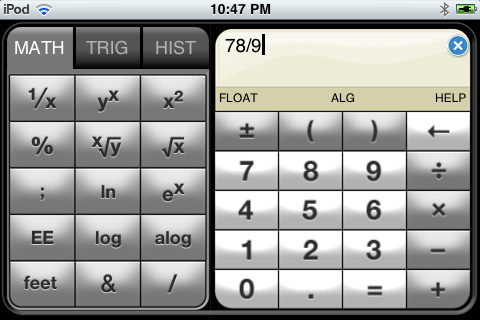 For those who have used a TI-89, you’ll feel right at home with with Symbolic Calculator. The focus of this app is it’s computer algebra system, and the interface is pretty easy to use for those familiar with Texas Instrument’s CAS calculators. If you’re new to CAS’s, just tap the question mark next to a given command, and an example will pop up demonstrating how to use the syntax appropriately. You can also use this app to graph, although it feels a little counter-intuitive until you get the hang of it, and the graphing features are simplistic compared to some of the other apps on this list. Another excellent grapher is Graph It. This is also a full featured grapher, which offers the ability to trace, find intercepts, and roots, as well as graph derivatives and integrals. It also offers a full scientific calculator with two-line display. The user interface is ok, but might take some getting used to for some users, particularly for the scientific calculator mode. For those in need of a 3D graphing app, Quick Graph is the way to go. There are other positives here too such as a strong user interface, simple to use polar coordinates ,and a good 2D graphing interface. Screen caps are another built in feature. The real selling point, though, is the 3D, which is well rendered and even accepts cylindrical and spherical coordinates. It is possible to use this app as a scientific calculator, but the interface feels a little strange. Trace is included with the “advanced features package” for $1.99. Not everyone is looking for a fancy grapher. For those looking for a more standard scientific calculator, Powerone LE fits the bill. It’s got a very intuitive interface that you’ll pick up right away. Powereone also features unit conversion and a currency converter that stays current to international currency exchange rates. Additionally, its got a simple statistics calculator that finds the mean of a series of numbers. It could be better if the scientific features used a two-line interface. If this post has caught you’re interest, and you’re in the market for a stand alone calculator, check out my post on the Best Graphing Calculators for School.